Being avid gardeners and active community gardeners we had plans for growing our own produce(as we had done in Brisbane) from the very start. So one week after we arrived, we started on the new vege plot. As you can see in this image, the area was dry, hard, and almost completely barren. 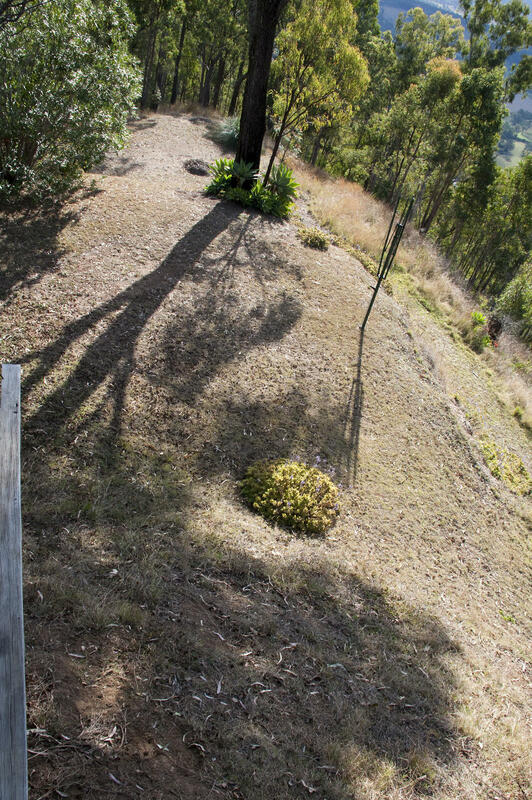 We started simply with a frame of treated pine sleepers, held in place by wooden pegs and steel strapping. The plot was aligned towards the North East so that we could control in part which areas of the plots got sun by the use of some judicious and planned plantings. The plot frame was filled with mountain soil, mushroom compost, horse manure, purchased garden soil. A little ‘worm juice’ and worm castings were also added. The plot was covered in cardboard, and repeatedly watered as we let the mix of soil etc cook for about 3-4 weeks. 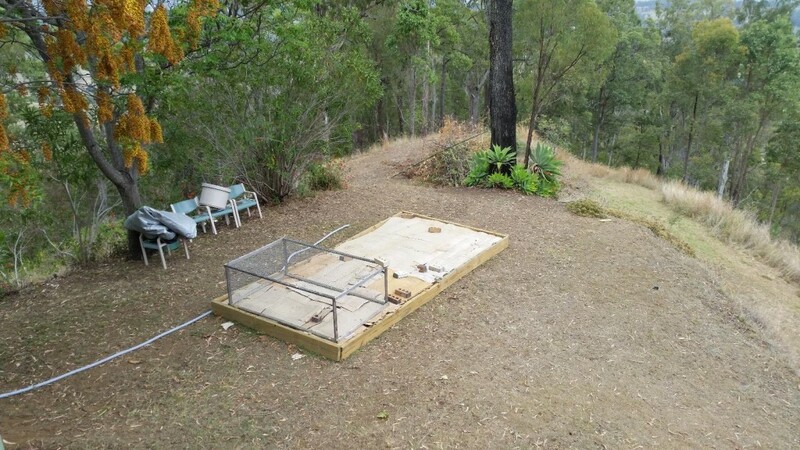 You can see in the image above, the anti-possum cages that we brought with us to stop possums and other native animals from devouring our produce. We picked these up off the side of the road in Brisbane one day. We assume they were chicken or pets cages that could be moved around. But the owners obviously did not want them anymore and they were on the verge and marked as FREE. It turned out to be a nice pick up for us. So now we wait. We will turn the soil again a few more times, and continue to water it as we wait for the worms, elements and sun to do their work. 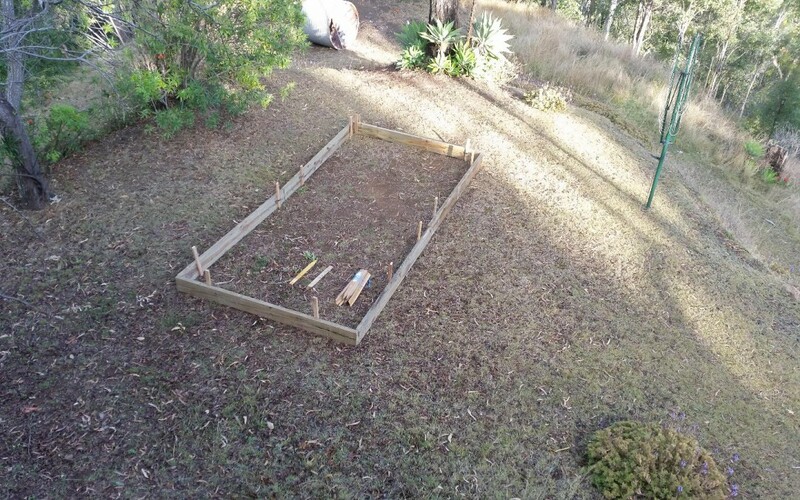 Some people may ask why we used treated pine sleepers for the garden plot? The sleepers are treated with copper/chrome/arsenic to deter termite invasion, and there are some that believe that this creates a danger for the person consuming vegetables grown in adjacent soil. Opinions are wide and varied, and evidence is scant. We have active termites all over the property, and have roughly 5-8 termite nests within view of the house. So the choice was fairly clear for us. Termites were going to be a problem long before arsenic was going to be. There are many opinions and pieces on CCA timbers and their “dangers” that can be found online. Here are just a couple.